A new generation shows us the other side of the Rainbow People. 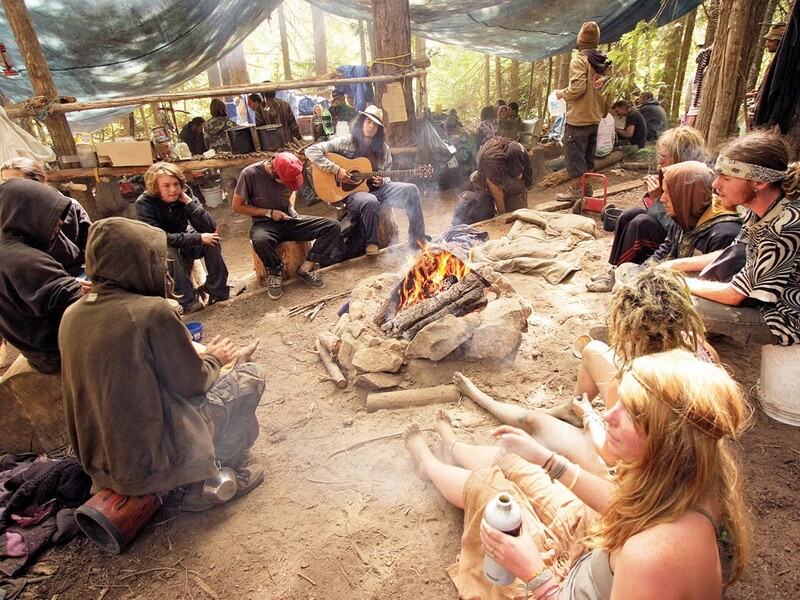 Campers listen to music at the Montana Mud camp, during the Rainbow People gathering in the Colville National Forest. “We’ve got trippin’ hippies and drunk dogs, so slow down,” a man yells at the cars passing by. Sometimes he makes the effort to get up and yell, but most of time he lolls in the dirt, surrounded by a campfire of woodland misfits. The five people who have gathered at the Welcome Home Camp look and act a bit weathered. In the dirt lays a cast-iron skillet with the remains of noodles. A blue-and-teal glass hash pipe sits next to a Folgers can. It’s packed and ready to go. Medical drugs and hallucinogens are condoned here, but everything else — including alcohol — is prohibited. The hallucinogens were probably responsible for last Friday: People got naked, painted themselves blue, put on tails and danced around like the Navi from Avatar. In a gathering that will continue through Sept. 7, the Rainbow People have congregated in a forest about 60 miles north of Spokane. More than 500 people have arrived from places as far away as New York. The Rainbows formed in 1972 in Colorado. They are nonviolent, exchange no money and strive to live peaceful lives. Regional gatherings serve as prelude to larger national meetings. The 2011 nationals, also slated to take place in Washington, are expected to draw 20,000 people. “We are a tribal anarchy, and there are a lot of people for whom Rainbow is their religion,” Finch says. The 20-something man wears a tattered, tie-dye Grateful Dead T- shirt and a top hat covered in pins. His long black hair and beard are speckled with the debris that comes from living in the woods. Finch was ushered into the Rainbow Family by his parents, who met at a gathering in 1986. He and a friend drove straight from Santa Cruz — 20 hours — to make it here. He calls everyone sister or brother and tells them how much he loves them. The free drugs and free love, once prevalent, are distant memories now. Since the ’60s, hippie culture has faded and then returned, leading to the current breed — a hybrid of hippie culture, with the Rainbow People as a perfect example. Young Rainbows often live on the street and hitch rides to the next gathering, where they get food, clothes, blankets and acceptance. Older Rainbows, Finch says, take the street kids and assimilate them into their counterculture. “It’s solving the homeless problem in the most creative way,” he says. A Spokane woman called Pippie has been at the camp for five weeks. “I joined the family as a young, homeless Rainbow and spent 10 years traveling from gathering to gathering,” she says. Pippie left the family briefly while forming a family of her own. Now her kids, ages 5 and 8, play at Kiddy Village, a place with homemade toys and games. A lot of work goes into an event like this. Pippie and four other families spent weeks digging waste trenches, finding access to running water, designating gray water sites and building the camps and kitchens scattered throughout the meadows. Here, Rainbows huddle under tree canopies, dance around the fire and congregate wherever there is ganja food and a drum beat. Camps with names like River Rats, Montana Mud and Fat Kids Kitchen feed the Rainbows and keep them warm. Arelim Steiner, 63, is about as original as they get. The Priest River naturopath and registered nurse runs the Calm Camp. Her repertoire of services includes everything from handing out condoms to treating head lice to sitting with someone who’s having a bad trip. A dreadlocked girl in a swimsuit top and filthy coveralls comes to Steiner when her puppy Ladybird needs water, and she herself needs cough drops for a scratchy voice that’s well beyond her age. In her own unique way, Steiner serves as a mother to the young, homeless Rainbows. “Mostly what I do here is just love on people,” she says. Steiner attended her first gathering in 1979 and now calls herself a Dinosaur Rainbow. She says she joined the family because they had a passion that was young, alive and proactive. She sees something else in the party kids who join the gatherings today. To get to the Rainbow People gathering, drive north on the Newport Highway. Turn left on Highway 211. Take a left on Highway 20. Take a left on Flowery Trail and a left on Bartlett Cut-off Road until you reach the Welcome Home Camp.